This set of 8 Triple Crown Shuffleboard Weights are tournament grade and ready for action. 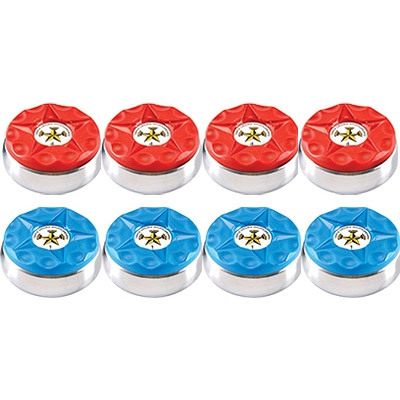 It includes four red and four blue shuffleboard pucks, so you will have a complete set to play with. They are made with hardened steel, chrome plating, and a nylon top for durability game after game. If you are looking for shuffleboard pucks that will last you for years, this set is exactly what you need. Three speeds are available from the drop-down menu, so you can get a shuffleboard weight set that matches your play style and table. Crowned is the slowest speed, which offers the best control. If you tend to play on shorter tables, than this is a good speed. For more juice, our medium speed pucks are the most popular. They balance control and velocity, while being usable on the broadest range of tables. Our fast speed weights are for those who do not need as much control, or have playfields with higher than normal friction.